A section of the Goldent Stairs. (photo by Albert Moore) (courtesy of Salvation Army). 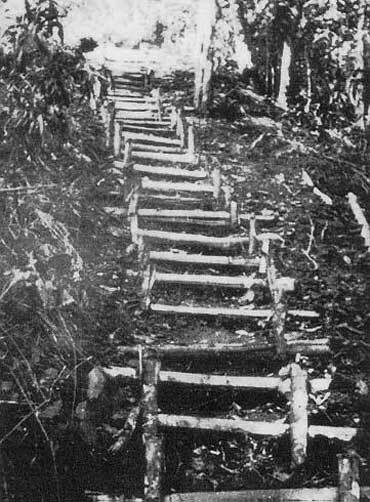 Imita Ridge was reached by the “golden stairs” which consisted of some 2,000 timber steps cut into the mountain side by the engineers. It was an exhausting climb. After leaving the Uberi track it rose 400 metres in the first 2 kilometres, dropped some 500 metres and then rose about 700metres in the last 2.5 kilometres. 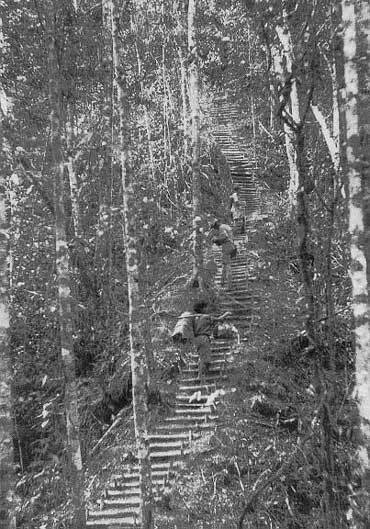 During 17 September 1942 Brigadier Ken Eather’s 25th Brigade at Ioribaiwa withdrew to Imita Ridge and its 3rd, 2/25th, 2/31st, 2/33rd and 2/1st Pioneer Battalions were deployed to meet the final Japanese attack. It was this withdrawal which caused intense consternation at the Allied headquarters in Brisbane. 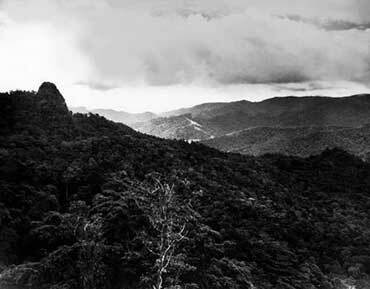 Lieutenant-General Sydney Rowell in Port Moresby told the 7th Division commander, Major-General Arthur (Tubby) Allen, that any further withdrawal was out of the question, “Eather must fight at all costs”. The Australians did not know that on 18 September the Japanese had been ordered to withdraw. Nevertheless, when the Australians began patrolling forward from Imita they struck Japanese defences, which were still in force on 25 September. On 28 September the Australians at Imita launched a major attack on the Japanese at Ioribaiwa, but found that the Japanese had abandoned the position. At last the Australians could begin their counter-offensive.